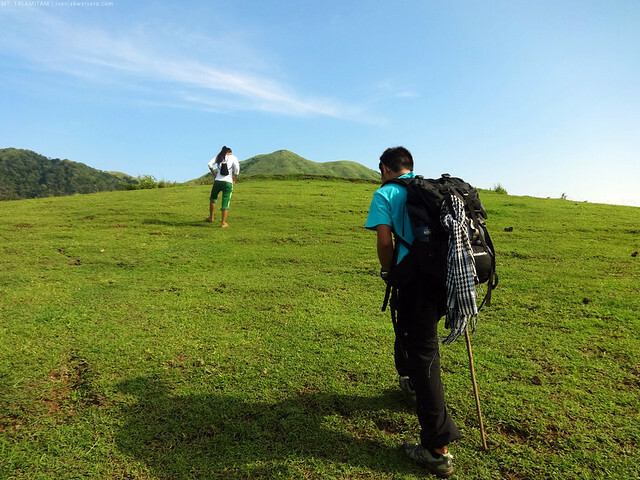 The idea of hiking up Mt. Talamitam was brought about by the fact that I haven't climbed it yet. That's true, Mt. 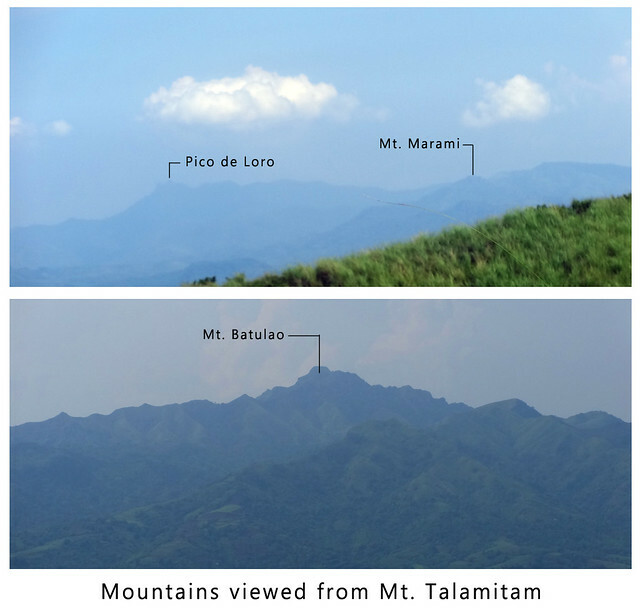 Talamitam was among the few Tagalog peaks that my itchy feet haven't touched yet (until this hike). The time has finally come, maaakyat ko na ang Talamitam. 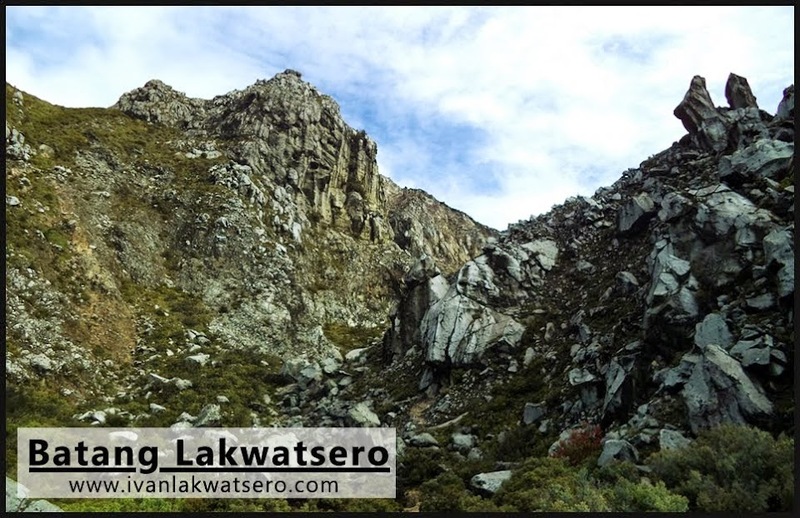 Many times I attempted a hike in this mountains, but always end up being postponed, and everytime it happens, I'm not too keen on pushing for the hike again (in other words, tinatamad talaga akong akyatin ang Talamitam). Certainly, it's not in my priority list. But fate eventually brought me to Brgy. 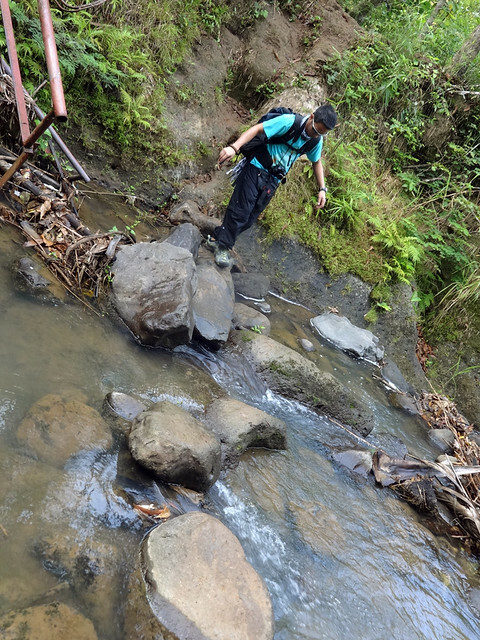 Bayabasan (the jump-off) to finally cross Mt. Talamitam out of my To-Climb list. Getting into Mt. Talamitam is really easy if coming from Manila. It's just a bus away, about 2 hours ride. Any Nasugbu-bound or Calatagan-bound bus from Manila (terminal is located at Coastal Mall in Parañaque) plies the route, just tell the conductor to drop you at Brgy Bayabasan, specifically at KM 83. 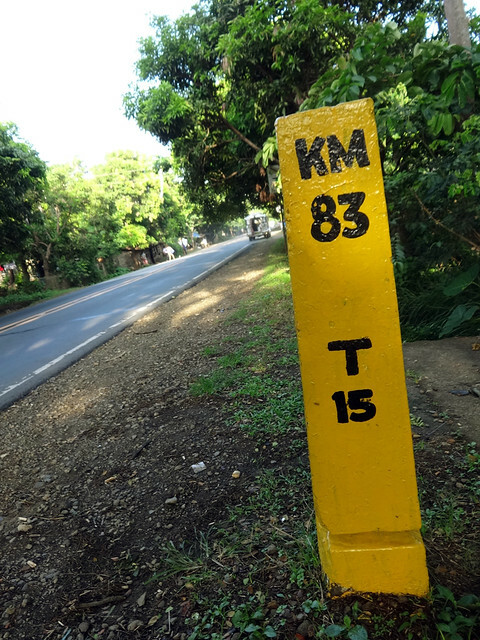 At Kilometer 83 of the road to Nasugbu, our adventure began. It was 07:00 in the morning and the weather was perfect for hiking (contrary to what the forecasters), with me are my buddies, Dawn and Darwin. A few minute stroll from the highway led us to the registration site where a certain Brother Paul welcomed us. He smiled, we smiled back. Straight to the point, I asked him if we could hike without a guide. But firmly he said no. Ok fine, hindi naman ako mapilit, hehe (300/guide). 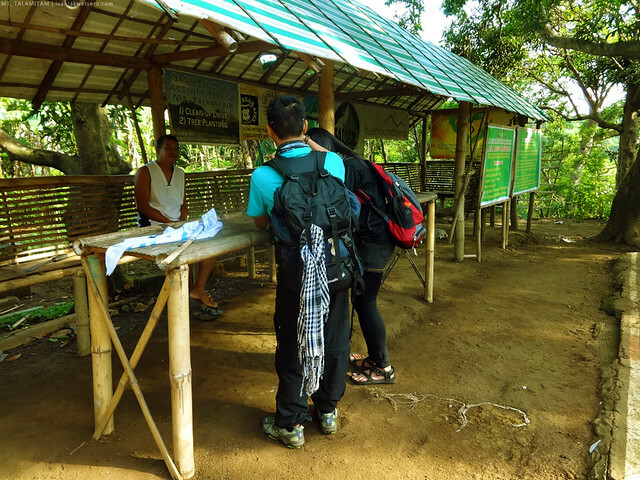 So we registered and paid the fee (P20), met with our guide, then off we go to Talamitam. 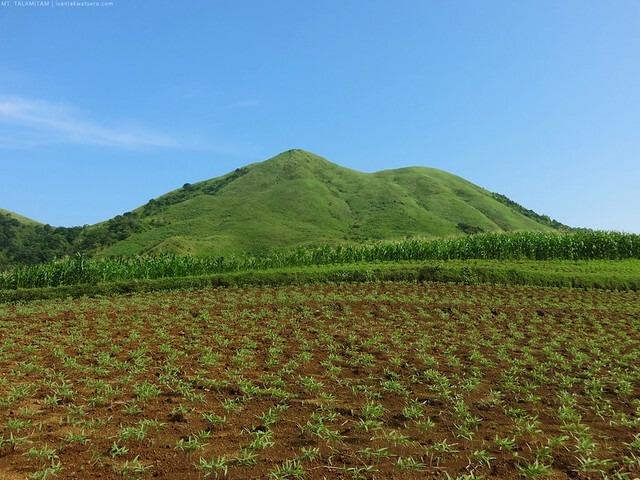 Like the nearby Batulao, Talamitam is a bald mountain, treeless, nothing but grass, hence the reputation of a really hot mountain. So right from the start, I tried to condition my mind that we're about to do a dehydrating hellish climb. at the registration site, we were the only hikers that morning. At first, the hike was really very easy. Downhill walk on a slippery concrete road and then through a concrete bridge. The road then degraded into a dirt path as we near the river. A bamboo bridge should have existed on that area, at least according to many photos I've seen online, but apparently, no bamboo bridge for us (nasira na daw). 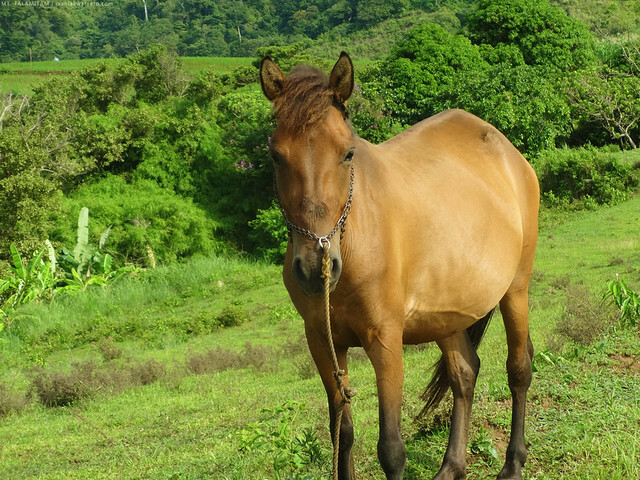 Right after crossing the river, we ascended a woodland with crisscrossing horse trails. 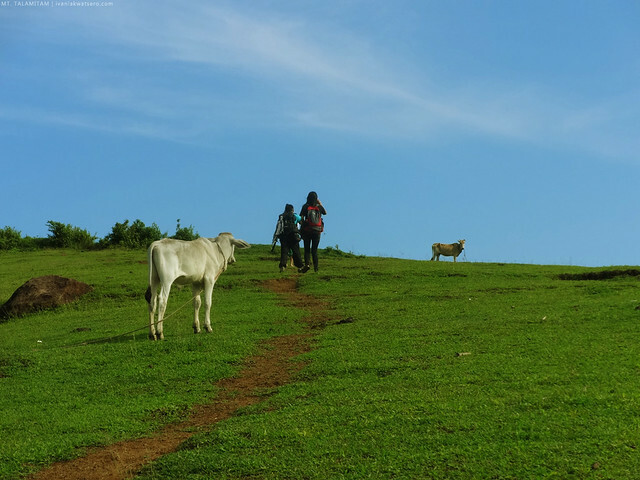 Locals take this trail regularly to access their fields up the mountain so don't be surprised if you happen to bump into someone along the way, greet them to show courtesy. 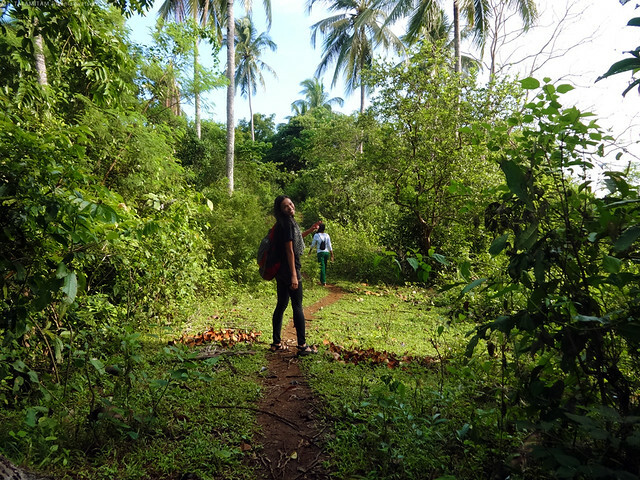 Good thing it wasn't raining when we're trekking, or else this part's gonna be very muddy. The ascend was gradual, and the trails were not even confusing (at least for me). 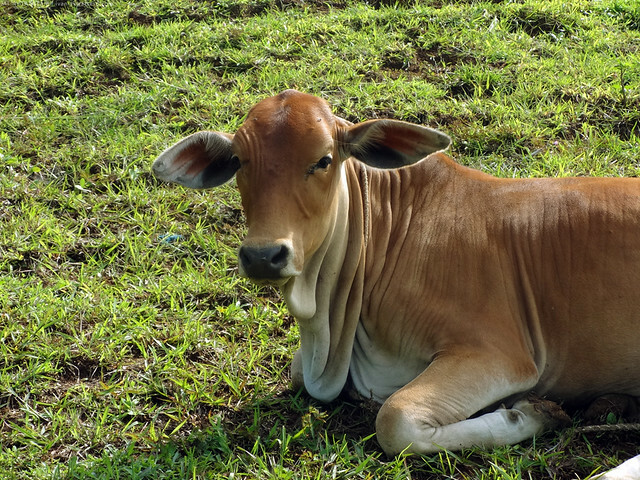 In fact, it all leads to just one place—the grazing fields of Talamitam. That's the reason why many protested about the mandatory guideship implemented by the barangay, kasi madali lang naman talaga makarating sa summit, oh well. But despite that all, humidity in the area was too wearing. Sobrang init lang talaga! We sweated a lot even though we did not exert too much effort on the trail. The wow part of Mt. Talamitam came as soon as we exited the hot woodland area. The grazing fields, which reminded me so much of the teletubbyland (from the kiddie show Teletubbies), looked so great, so unlike the photos of dry grassland I've seen in the internet. The lively green field against the very blue sky was surreal, a wonderful sight to behold. unquestionable beauty. Teletubbyland indeed. Summit of Mt. Talamitam at the background. 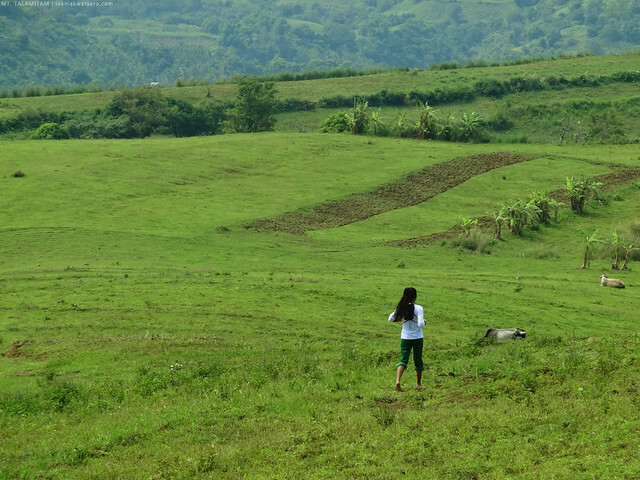 I'd love to run/roll around and sing, "the hills are alive with the sound of music...", kaya lang maraming poop. clearly, the open trail was too hot, exposed to sun's unmerciful heat. As much as we wanted to stay and enjoy the scenic teletubbyland, the sun's heat was becoming too unbearable, so again we started to move forward. Rural scenes followed. 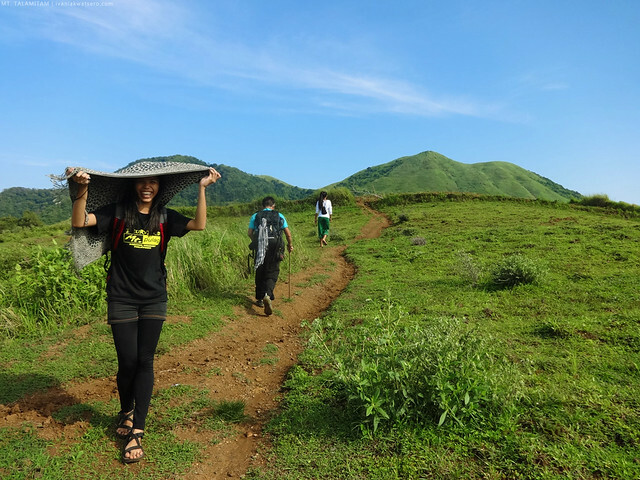 The final assault to the summit, which came after the farmlands, was the most tiring part of the hiking experience. Steepness and sun's heat connived to weaken our passionate spirits. But obviously, their tag team failed to stop us from reaching the summit at 09:20 AM. Woohoo. 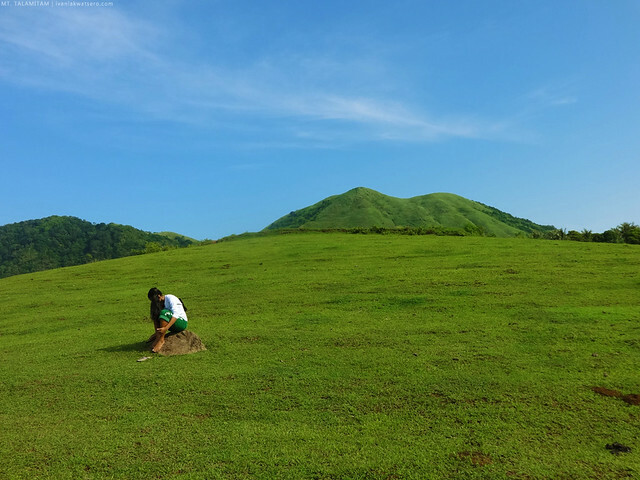 The grassy mountain top offered stunning views of plains and nearby mountains. There were the mountains Batulao (SE), Marami (NW) and Pico de Loro (NW). one happy group at the summit of Mt. Talamitam. We stayed at the summit for like 30 minutes, taking pictures of the pleasant views around. Somehow I forgot that we're standing in an open space at the sun's mercy. Our guide ran down the steep trail when we told her that it's time to descend. We enthusiastically followed her pace of course. Descents are my favorite part of the hike, and doing it with speed makes me ecstatic. dahil long legged si ate, siya ay kumaripas at hindi ko mahabol. In no time, we're back again at the jump-off. Brother Paul was there again smiling at us. We rested, took the time to chit chat with the fellows. Before we fled for Mt. 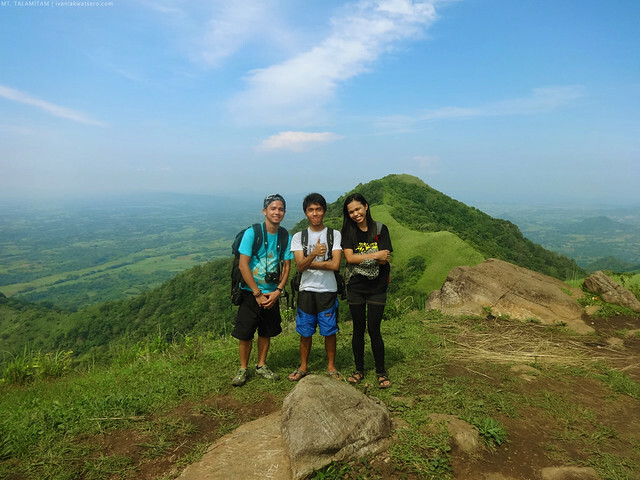 Batulao to complete our Nasugbu twin hike, I told myself, "the climb was worth it." My 45th mountain, completed. 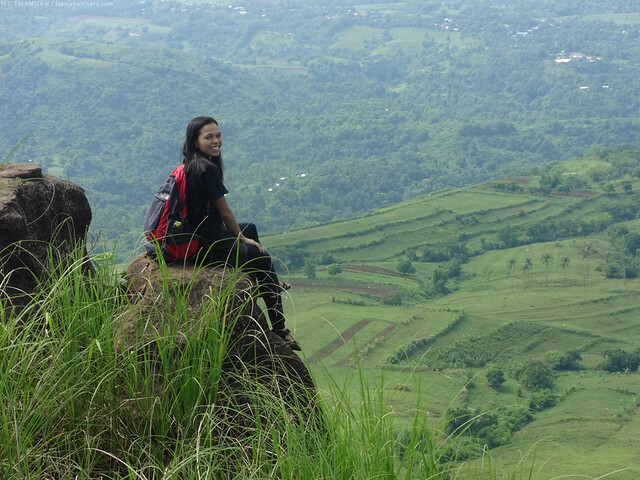 Thanks so much to Dawn and Darwin for joining me, and to Bebs, our guide for this hike. Mt. Talamitam was the biggest surprise of the month, it greatly exceeded my expectations. 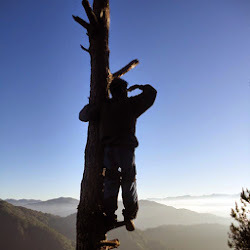 A very sulit climb.